Farmington Brewing Company » Events » Upcoming Events » Sporcle Trivia Sunday Nights at FBC! Farmington Brewing Company > Events > Upcoming Events > Sporcle Trivia Sunday Nights at FBC! Sporcle Trivia Sunday Nights at FBC! 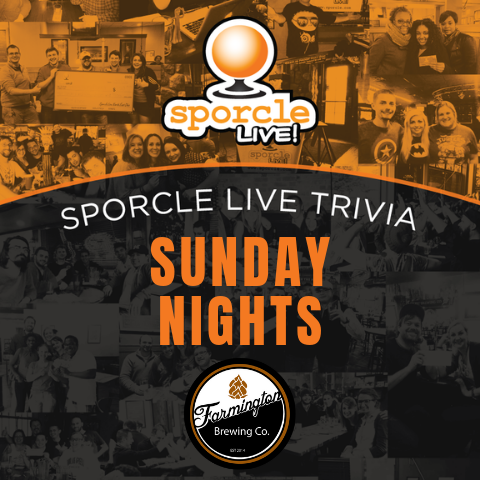 Join us at the brewery on Sunday evenings for FREE trivia with Sporcle! There will be two, one-hour games each night, beginning at 6:00 and 7:00 PM. Prizes are given to first and second place groups per game, and you do not have to participate in both games in order to win. Be sure to enjoy a Sunday evening with friends, games and a pint with the FBC and Sporcle!